Granted, it doesn’t sound odd for a farm, does it? 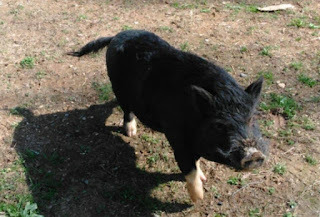 That afternoon, when my husband returned home, he came in and asked… “Hey, did you know there’s a pig out here?” I went to take a look and, sure enough, there was a pig. He was inside the main gate, next to the driveway, on the outside of the pasture fence. He was definitely skittish but didn’t run too far when we approached him. 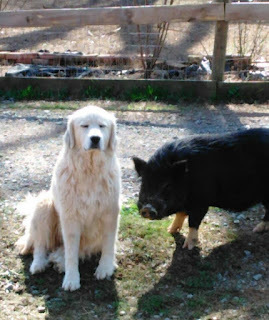 For three days, he stayed right next to the pasture fence – close enough to the goats and Pyrenees – to feel safe. He even crafted a bed out of the pine straw in the landscaping right against the fence. We were giving him food and water and trying to track down where he belonged. I finally got a lead, made some calls and found that he belonged about ¾ of a mile away. I spoke with the owners who said that, if it was okay for him to stay, they could come the next day (Saturday) to get him. On Saturday morning, when my husband went out to feed everyone, he took a bowl of food out for the pig. But, the pig was nowhere to be found. 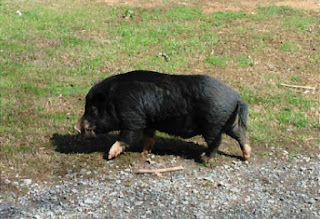 He then went to the barn to feed the goats and dogs and, there, in the middle of the pasture, was the pig. He had broken “into” the pasture to get closer to the other animals. The owners came down later that morning (with two relatives to help) and they spent an hour chasing that pig all over the pasture. They told us that he was afraid of men and gave us a little background on how they came to have him. Finally, after chasing him with no luck, they said they were going to Tractor Supply to buy a trap and would be back shortly to get him. About an hour later, there was a knock on the front door. The owner said he had gone home and spoken with his wife. He said he told her how happy the pig seemed to be and they decided that we should keep him. I wasn’t looking to add a pig to the farm but,… it looks like the pig had other plans. So, we became the proud owners of a pig. He seems to think he’s a dog. He sticks right with Reagan and Sasha (the two Pyrenees) and continually wags his tail. He truly has found a safe and happy home with us.